A proton (p), with baryon number 1, decays into a positron (e+), with baryon number 0, and a neutral pi-meson (π), with baryon number 0. This decay is predicted by several popular secular models2 but has never been observed in nature because it violates baryon conservation, i.e., 1 ≠ 0. The current lower limit for a proton’s half-life is 1.6 x 1034 years,3,4 which is 24 orders of magnitude greater than the secular age of the universe. So, the total number of baryons in the universe remains constant according to our most recent observations in spite of many secular hypotheses to the contrary. This process is fully reversible since the baryon number on both sides of the reaction is 0. When the proton and antiproton come into contact, they will annihilate into two high-energy photons. This means one of two things had to have happened for our observable universe to exist according to secular science. Either the matter and antimatter somehow congregated in different areas of the universe, or there is an asymmetry in the interaction of matter and antimatter that leaves a small residual amount of matter but no antimatter after the annihilation process. When matter and antimatter annihilate, characteristic back-to-back high-energy gamma rays are produced. These rays have not been observed in any significant amount from galaxies or superclusters interacting with the normal matter in space. So, while antimatter may be produced in very small amounts by certain extreme phenomena in the universe, there is no observational evidence for large groupings of antimatter. To date, no experimental evidence exists that annihilation reactions produce a surplus of matter along with the gamma radiation. The universe didn’t explode into existence but was instead designed by a Creator to be inhabited. So, where is the antimatter that the Big Bang hypotheses predict must exist in our universe? Maybe the universe didn’t explode into existence but was instead designed by a Creator to be inhabited,5 as the first few chapters of Genesis indicate. Lisle, J. and V. Cupps. 2016. Subatomic Particles, Part 2: Baryons, the Substance of the Cosmos. Acts & Facts. 45 (8): 10-13. Nishino, H. et al. 2009. Search for Proton Decay via p → e+ π0 and p → μ+ π0 in a Large Water Cherenkov Detector. Physical Review Letters. 102 (14): 141801. Bajc, B. et al. 2016. Threshold corrections to dimension-six proton decay operators in non-minimal SUSY SU(5) GUTs. Nuclear Physics B. 910: 1-22. Abe, K. et al. 2017. Search for proton decay via p → e+ π0 and p → μ+ π0 in 0.31 megaton • years exposure of the Super-Kamiokande water Cherenkov detector. Physical Review D. 95 (012004): 1-10. * Dr. Cupps is Research Associate at the Institute for Creation Research and earned his Ph.D. in nuclear physics at Indiana University-Bloomington. He spent time at the Los Alamos National Laboratory before taking a position as Radiation Physicist at Fermi National Accelerator Laboratory, where he directed a radiochemical analysis laboratory from 1988 to 2011. He is a published researcher with 73 publications. Cite this article: Vernon R. Cupps, Ph.D. 2018. 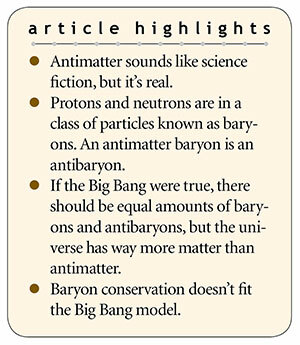 Baryon Conservation and the Antimatter Mystery. Acts & Facts. 47 (11).